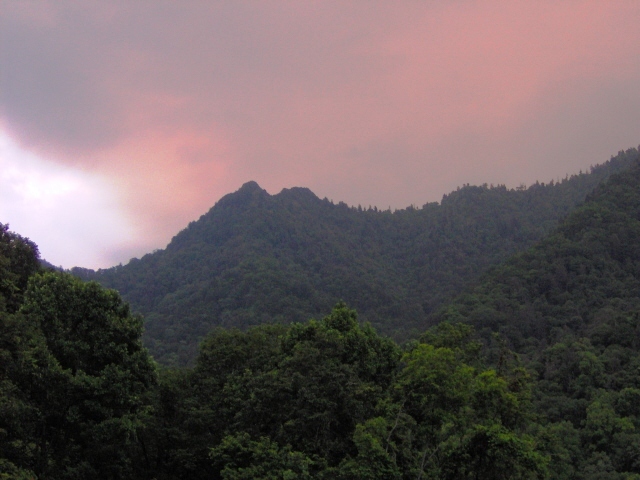 The twin peaks of Chimney Tops present some of the finest panoramic views in Great Smoky Mountains National Park. Chimney Tops trail is one of the most popular trails in the park, and yet it’s not exactly easy. Although fairly short, the trail is very steep and quite challenging, but the rewards are what people remember about it, and the reason they keep coming back. Here are some things you should know before you try the trail yourself. It’s a 4-mile hike round-trip, 2 miles each way. Pick a dry day, and leave yourself plenty of daylight to return in, because you’ll want to linger at the top, and it’s not a trail you want to take in failing light or bad weather. At the top it can get very slippery in the wet. Carry water to drink and snacks for a picnic at the top – you’ll be tired when you get there and you won’t want to leave the stunning views anytime soon. It goes without saying you want to bring your camera along. Also, no pets of course. From the Sugarlands Visitor Center at the entrance to the park from Gatlinburg, the Chimney Tops trailhead is 6.7 miles along Newfound Gap Road. (At 4.4 ,miles you’ll pass the Chimneys Picnic Area, which is a different place.) You can see the peaks as you approach the area. The trail ascends 1400 feet in two miles, most of it in the 2nd mile. The first mile is easy, with several level places during the ascent, and great scenic views, as well as 3 stream-crossings by bridge. The mountain stream has lots of large boulders and pools, perfect to sit and cool the feet. The second mile, where the trail forks to the right, is where the work starts. Chimney Tops Trail is recently renovated, which is useful, but still there’s a lot of loose rock, and hiking boots with ankle protection would be the best footwear. Gloves may be useful too. The trail can be crowded, so bring your steady patience to the task of climbing up to the summit. This climb is very steep, definitely arduous – it’s a workout that takes a bit of stamina. The Chimney Tops are a pair of rocky outcrops. As the trail arrives at the base of the taller of the two pinnacles, it relents a little and gives you a breather with a bit of down slope. There’s a trail to the side of the pinnacle that works its way around towards the top, and if it’s open this is the way you want to follow. The views are magnificent. People at this juncture do climb to the top of the pinnacle directly, and it’s definitely a scramble – close to actual rock climbing in places, although no technical gear is required. Even so, falling would be dangerous. The bare rock is slippery in the rain or ice, and not recommended – you could easily injure yourself, and people do. On dry days, many people including kids clamber up it wearing sneakers – having ignored all suggestions about hiking boots with their far better grip – while others turn away. It’s okay to hang out at the base of the pinnacle, and for that matter, many people treat the first mile of this trail as their playground, and resist the fatiguing climb of the peak. If you don’t get vertigo, the 360-degree views of the Smoky Mountains from the peak are exhilarating to experience, although arguably not much different from other scenes slightly lower down. Know your capabilities and play safe around the Chimney Tops. From the first outcrop, you can also work the saddle to the lower chimney, which does require some experience and skill. Chimney Tops Trail is open year-round except for the periodic, weather-related closures that can happen anywhere in the park. If you’re not fond of crowds, start early and avoid the weekend, as with everywhere in the park. And if you play in the stream along the trail, make sure you read the park’s advice on Water Safety.